The controversial former MP has failed at the last two elections. Prime Minister Malcolm Turnbull with former MP Sophie Mirabella. 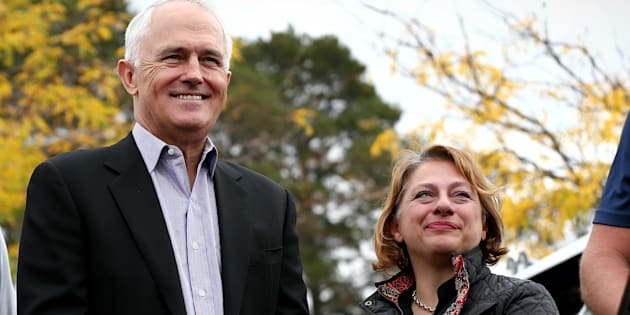 Sophie Mirabella, the maligned former MP for Indi who failed to get elected at the last two federal polls, has decided to formally quit politics. Mirabella, the former Liberal firebrand, held her Victorian seat from 2001 but was ousted by independent Cathy McGowan in the 2013 poll and failed to win Indi back this election. She appeared on Sky News on Monday night, and announced that her immediate future would not include another tilt at parliament. "I'll always have an interest and I'll always support good people... but it's time to think of my family and do other stuff. I'm young, I've got a lot of experience, a lot of skills. I'll be on this side and be a commentator, rather than a participant," Mirabella said. "When the left-wing media, and GetUp! and the unions get together with the Melbourne-based feminists to have a go at you and they've had a go at you, what more can they do?" The announcement seemingly brings to an end a controversial career for the former MP. Known as a polarising and divisive presence in the parliament, she was nominated as "the nastiest" person in politics by Tony Windsor in 2013, when asked about the person he would least miss in parliament. In her time, Mirabella compared former Prime Minister Julia Gillard to Libyan dictator Muammar Gaddafi; boycotted Kevin Rudd's apology to the stolen generations; and in a bizarre 24 hours to kickstart her 2016 election campaign, was accused of shoving her opponent, then claimed that the government withheld $10 million for a local hospital because she was not elected at the 2013 poll. In one memorable incident in 2012 on ABC program Q&A, Mirabella was roundly slammed for simply staring blankly at a fellow panellist after he passed out on the show, and not offering help.